Summon your axolotl eft minion. Because there truly is nothing more adorable than an oddly Lalafellin face on the body of a moist, frilled salamander. 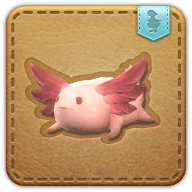 The retainer who reeled in this specimen claims it is the fabled hundred-eyed axolotl, but at a glance it is short at least ninety-eight. Nor would the man say where he found the creature. For now, it shall be called an “axolotl eft” until such time as naturalists decide what it actually is. Doubles the amount of HP restored to allies stationed in Gates.